The Mets are victorious! They are record breakers! They are cheese steak connoisseurs? On April 30th the Mets broke the record for most cheese steaks devoured by a team in one day at Citizens Bank Park in Philadelphia. The Mets ate 103, yes 103 cheese steaks during the rain delay and postponed game that day. They may not win in the standings, but watch out for these Mets in the buffet line. I guess we now the mystery of one of the biggest Mets questions of 2014. 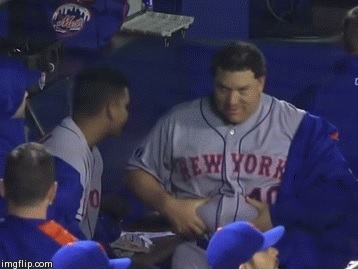 What is in Bartolo Colon’s tummy? If anyone was wondering why the Metropolitans maybe moving slower these days, I think we can thank the cheese steaks for that. Maybe that’s why they played so many innings this past weekend. To have more time to chow down. The Mets broke the unofficial record of 80 by a wide margin, but this might have only been the appetizer. Who knows? If the team is out of contention in August they might forget about the game on the field and try to reach to 120 mark. One thing is for sure, if Terry Collins takes his team to Pizza Hut after the game, that’s going to be one New York size bill.